Photos of Qiu Jin are quite rare, so this is actually Hua Mulan, an influence on Qiu. 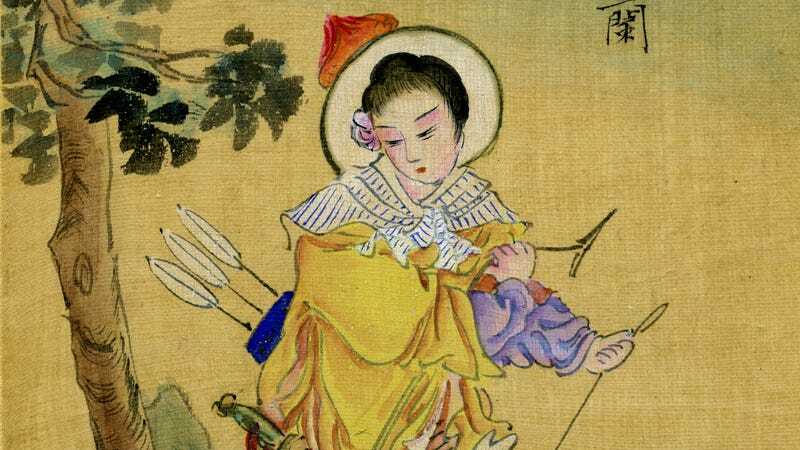 What it’s about: A 19th-century Chinese poet, teacher, orator, feminist, and revolutionary, who became a legendary figure after she was executed in 1907 for a failed attempt to overthrow the Qing dynasty, just five years before a successful attempt to do the same. Biggest controversy: Relationship problems may have led to Qiu wanting to overthrow the government. Wikipedia says, “During an unhappy marriage, Qiu came into contact with new ideas. She became a member of the Triads and Tongmenghui secret society.” The latter group was Sun Yat-sen’s organization that wanted revolution and a representative government. The former is the very same Triads that remain a force in transnational organized crime today. We feel like the article skipped several crucial steps between “unhappy marriage” and “organized crime syndicate,” but perhaps there are unhappily married women who go out for a pack of cigarettes and come back an hour later with a stack of extortion money. Qui’s association with Tongmenghui, at least, gets more of an explanation. In 1903, she traveled to Japan to study, leaving her husband and two children behind. There she joined an anti-Qing society called Guangfuhui, which merged with several other groups in 1905 to form Tongmenghui, as part of Sun’s efforts to join every revolutionary group under one common cause. Thing we were happiest to learn: Qiu was an early feminist icon, and is still revered as such in the Republic Of China today. While at school in Japan, she adopted Western male dress, practiced martial arts, and was outspoken against foot binding and oppressive arranged marriages, having suffered both. She often spoke publicly for women’s rights, and better education for women. She also co-founded a “radical women’s journal” with fellow poet Xu Zihua, but it was shut down by the authorities after two issues. Also noteworthy: Qiu’s revolution happened eventually. The Anqing Uprising that she had planned was brutally put down (her cousin Xu Xilin was a police commissioner who led the uprising and planned to assassinate the provincial governor; the governor’s guards “cut out his heart and liver and ate them”). But Anqing was merely one of a steady stream of uprisings against the Qing. While the government continued to respond brutally, republican sentiment only grew, until the Wuchang Uprising succeeded, capturing that city, and sparking more protests all around the country. (Most wanted a republic; a few wanted to go back to the Han dynasty.) Finally, the Republic Of China was established on January 1, 1912. It would only reign over mainland China for 37 years, before another revolution—that of Chairman Mao—would push the government to Taiwan, where it remains today. Best link to elsewhere on Wikipedia: Several films through the years have portrayed Qiu’s life. She also makes a brief appearance as a character in 1911, starring and co-directed by Chan Kong-sang, known to the English-speaking world as Jackie Chan. His extensive biography on Wikipedia covers the beloved action hero’s 150-plus films, for which Chan has famously performed his own jaw-dropping stunts. Other revelations on his page include his training as an opera singer and subsequent success as a pop star in Cantonese and Mandarin (he also often sings the theme songs to his films); and his statuses as both the second-highest-paid actor in the world and one of Forbes’ 10 most charitable celebrities. Further down the Wormhole: One of Qiu’s poems refers to Japan as “three islands,” a nickname for the country at the time. The islands in question are Honshu, Kyushu, and Shikoku. (Hokkaido is left out, for reasons not explained here.) Shikoku is the smallest of the three, and lies more or less between the other two. The island is a tourist mecca during the Bon festival, a Buddhist holiday honoring ancestors that has evolved into a carnival-like holiday with dancing and games, usually centered around a family reunion. Because Bon combines celebration and the spirits of the dead, it’s sometimes likened to Halloween, an Irish holiday that America has exported all over the world. We’ll look at the geography of Halloween next week.